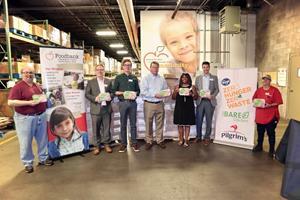 Pictured, from left to right: Jeff Wolfe (Inventory Control Coordinator), Tom Weiglein (Chief Strategy Officer), Zach Nissen (Regional Outreach Coordinator), Jay Robinson (Pilgrim's), Debbie Hansley (Corporate Partnerships Coordinator), Andrew Elder (Kroger), and Michelle Parrish (Warehouse Assistant). Pilgrim's and Kroger have partnered to donate 750,000 meals to support Hurricane Florence recovery efforts. The Pilgrim’s and Kroger teams are proud to lend their support to Hurricane Florence recovery efforts. Partnering with Feeding America, the joint effort will distribute 750,000 meals to families and local communities in the Carolinas recovering from the natural disaster that made landfall on Sept. 14. Pilgrim’s and Kroger have partnered with several Feeding America relief organizations to assist with product distribution, including: Low Country Food Bank, Myrtle Beach, SC; Harvest Hope Food Bank, Columbia, SC; and Second Harvest of Coastal Georgia, Savannah, GA.
Pilgrim’s has also donated an additional 19,000 pounds, or 180,000 meals, to support Hurricane Florence relief. In addition, Pilgrim’s team members in Georgia, North Carolina, South Carolina and Virginia have provided food, ice, bottled water, and clothing, and volunteered to assist in local cleanup and recovery efforts. To learn more about Pilgrim’s and Just BARE’s Raising Goodness® efforts in communities, visit pilgrims.com, justbarechicken.com or follow @JustBAREChicken on social media. Pilgrim's employs approximately 54,000 people and operates chicken processing plants and prepared-foods facilities in 14 states, Puerto Rico, Mexico, the U.K, and continental Europe. The Company’s primary distribution is through retailers and foodservice distributors. For more information, please visit www.pilgrims.com. At The Kroger Co., we are dedicated to our purpose: to Feed the Human Spirit™. The Company focuses its charitable efforts on hunger relief, K-12 education, women’s health initiatives and local organizations in the communities it serves. Kroger’s Atlanta Division is headquartered in Atlanta, Ga., and is one of the Southeast’s largest retail grocery chains with more than 183 stores, covering Georgia, eastern Alabama and South Carolina. Just BARE® is distributed nationally by Pilgrim’s Pride. The brand lives its mission of good food for more people by providing Natural/No Antibiotics-Ever and Organic varieties of chicken with no antibiotics, no added hormones, no animal by-products (vegetable and grain fed), and no artificial additives. Just BARE Natural/No Antibiotics–Ever products are third-party humane certified and traceable to family farms. Organic Just BARE is USDA-certified organic. To find simply delicious recipes, nutrition information and general cooking and safe handling tips, visit www.JustBareChicken.com. Find Just BARE on Facebook, Twitter, Pinterest and YouTube.